Not long ago, the Naruto manga ended its 15-year run. However, readers were quick to notice there was one story left to tell. Thus comes The Last: Naruto the Movie—not an out-of-continuity side story but a true missing tale that answers the most important question left by the ending of the manga. 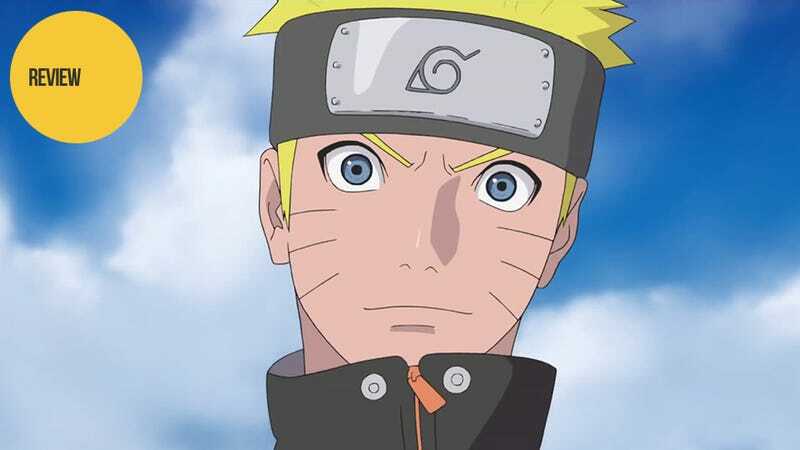 The film itself begins with a chronological recap of the world of Naruto, starting with the Sage of the Six Paths and leading up to Naruto and Sasuke's climactic final battle. What makes the recap special is the way in which it is animated. Unlike the rest of the film it is animated in a black and white manga-style with a heavy sumi-e ink brush influence. It really looks amazing and it's a great treat to see the most memorable moments of the Naruto story re-imagined in this way. The Naruto manga ended on an epilogue showing that not only had Naruto married Hinata some time after his final duel with Sasuke but also had two children with her. This was more than a little odd as, while it was obvious that Hinata had carried a torch for Naruto from day one, his feelings towards her were of a friendly nature and nothing more. The Last does a great job of showing how his feelings change from friendship to love. We get to see Naruto's life in his years between the end of the manga and the epilogue. Unsurprisingly, Naruto is respected and loved by the people of the village—especially the young female ninjas who want nothing more than “Naruto-senpai” to notice them. Yet, he is oblivious to their romantic intent—he is simply happy to be truly accepted. Hinata, on the other hand, is stuck in the role she has always been in: girl pining for Naruto from afar. Determined to change her role (with a bit of cheering on from Sakura), she attempts to make her feelings known and understood by the often oblivious Naruto. It's then, of course, that the villains of the film strike and Naruto and Hinata must head off with a team to stop the newest threat to the world. Looming catastrophe aside, the film is focused on two things: development for Hinata—why she feels as she does for Naruto and how her love for him came to be—and Naruto having to reconcile his own feelings for her after accidentally discovering that she loves him. So really, The Last is the Naruto and Hinata show—as it should be. The supporting team is made up of Sakura, Sai, and Shikamaru who each get their own little moments to shine and be useful in the movie's battles. Sakura gets a bit more than the other two as she is the best friend and confidant of both Naruto and Hinata. Seeing how Sakura and Naruto's friendship has solidified in their adulthood is a nice touch as well. As for the other members of Naruto's enormous cast, you do get to at least see the kages in action and pretty much every character who's ever spoken a line in the whole epic appears on screen at least once—with many getting a single cameo line or two. Even Sasuke, arguably the series' break out character, has a meager few seconds of screen time. And let me re-iterate: this is a good thing. This is not his nor anyone else's story other than Naruto and Hinata's—well, and the villains (but we'll get to him later). But of course Naruto is not, nor has it ever been, a romance manga. No, Naruto is about fights and action so there is more than a fair share of those in the film as well. The main action plot centers around an orbital threat—namely that the moon is breaking apart and dropping meteorites across the planet. At the same time, Byakugan users are being targeted and subsequently killed or kidnapped. So when a group of masked ninjas abduct Hinata's sister Hanabi, it's up to Naruto, Hinata, and their team to uncover the group's mysterious plans and how they are related to the moon's literal fall from the sky. Really, this plot has only one purpose: to give everyone something to do. We have numerous scenes of Naruto fan favorites taking out falling chunks of the moon over the course of the film—and of course Naruto's team fight scores of ninjas (as well as a giant crab). They're entertaining enough as far as fights go. The setting also provides some conflict for Naruto and Hinata to overcome in their growing relationship by paralleling the Japanese legend of The Tale of Princess Kaguya—with Hinata cast as the princess from the moon, Naruto as her earthly love, and the villain as her betrothed prince on the moon. It is somewhat contrived and predictable but luckily Sakura's on hand to talk sense into Naruto before the foolishly angsty drama goes on for too long. Anyone who's finished the manga knows Naruto's power level at this point—i.e., he's on par with the gods themselves. Surprisingly, the film uses the manga's extensive lore to create a villain that could realistically give Naruto a run for his money. The other problem with having a villain on par with Naruto power-wise is that it makes someone like Hinata nearly useless in a fight. The film tries its best to make her seem capable in her own right by giving her problems to resolve that Naruto can't with brute force alone. But when the villain can telekinetically restrain her with a look or mind control her with little more than a touch, it's hard at times to see her as anything more than a damsel in distress. All in all, I'm surprised by how much I enjoyed The Last: Naruto the Movie. Unlike the other Naruto films I've seen, this one carries real weight as instead of a non-canonical one-off, it is a vital part of the story never before told in either the anime or manga. If you've ever wanted a Naruto love story or wanted to see how the characters mature as adults, this film is definitely worth a watch. Yes, the villain is forgettable and much of the conflict predictable, but those weaknesses are overshadowed by what is basically a Naruto/Hinata character piece that closes the door on one generation and sets the stage for the next one to come. The Last: Naruto the Movie was released in Japanese theaters on December 6, 2014. The film will be coming Philippines in January 2015 and to Australian theaters as well in 2015.